The Tom McCall Waterfront Park was created after the removal of the Harbor Drive Expressway in Portland, Ore. Photo by Joel Mann. The famed U.S. intellectual Lewis Mumford once said, “Forget the damned motor car and build the cities for lovers and friends.” The recently released report on freeway removal from by the Institute for Transportation and Development Policy and EMBARQ (the producer of this blog) seems to be getting a bit closer to that ideal, providing case studies on cities that have successfully removed freeways tearing their cities asunder or separating waterfronts from the enjoyment of residents. The report notes that cities are undertaking these highway removal projects to foster economic development and offer better solutions to meet mobility needs. One additional key aspect to consider is the effect of these highways on quality of life (or “love,” as Mumford might suggest) and public health—from air pollution to traffic crashes to limiting the ability of residents to be active in their daily lives. These considerations will need further research, but several positive benefits can be observed from what already exists. Heat island and air pollution. Removing a freeway and replacing it with a greener boulevard or park can reduce the “urban heat island” effect and air pollution. In Seoul, Korea, when the city turned the Cheonggyecheon Expressway into a 5.8-kilometer linear park and daylighted stream, this led to a reduction of the heat island effect by as much as 8 degrees Celsius, according to summertime measurements in comparison to nearby paved roadway conditions. According to the new ITDP/EMBARQ report, air quality also improved. Levels of coarse particulate matter, or PM10 (emitted by vehicles and dangerous to human health) decreased between 2002 and 2006 in areas both near and far to Cheonggyecheon, dropping 21 percent near the project, compared to 3 percent farther away. Other pollutants, including NO2 and VOC/BETX (Benzene, Toluene, Ethylbenzene, m+p-Xylene) decreased in areas around Cheonggyecheon after the restoration project. NO2 density went from the average level found in the city to 0.83 times of that in the surrounding area. BETX pollutants around Cheonggyecheon decreased by as much as 65 percent. Active transport and recreation. Freeway removal is really about shifting priorities from moving cars to moving people. This can result in people being more physically active and healthier. Studies have begun to show that those who travel by mass transport, walking and biking as their main ways of getting around are more physically active than those who primarily use cars. Freeway teardowns not only encourage more active forms of travel, they can create signature recreational amenities for cities, as most of the documented examples have. 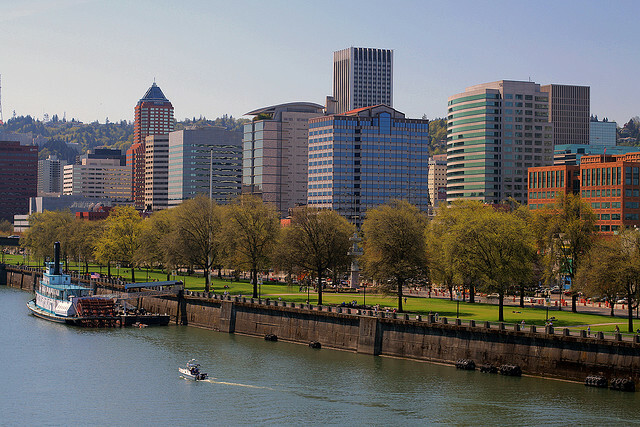 In Portland, Ore., the 36-acre Tom McCall Waterfront Park was created after the removal of the Harbor Drive Expressway along the Willamette River. The park now has roughly 1.6 million users per year, with people running, biking, walking their dogs, playing Frisbee, and attending major events and the park’s Saturday market. As studies have shown, there are real health and economic benefits to people’s use of parks that a freeway does not provide. Road safety.Steering the large ship of citywide traffic crashes downward means a comprehensive approach to reducing vehicle miles traveled within a city but still providing quality mobility. Freeway removal provides opportunities to shift people to safer transport modes, emphasizing pedestrian safety and mass transport. In Seoul, Korea, the city complemented the removal of the Cheonggyecheon highway with a restructuring of the city’s bus system. According to the EMBARQ/ITDP report, a network of median bus-only lanes was greatly expanded to 42 miles and there was an additional expansion of curbside bus-only lanes. Fares and schedules were coordinated and integrated with the subway system, and services were color-coded (local downtown buses, for example, are branded in yellow.) A smart card was introduced, and intelligent transport systems (ITS) technology is now used to manage the system. The results: “within months, rider satisfaction had reached 90%, speeds in BRT corridors had improved by 33% to 100%, and accidents and injuries on all routes had fallen by a third.” In addition, the number of vehicles passing through downtown decreased 9 percent after a bus rapid transit (BRT) system and aggressive Transportation Demand Management (TDM) measures were implemented as part of the project.